Hot Dipped Galvanised Steel to DIN 741 Specification. Wire Rope Grips are also know as Bull Dog Grips. 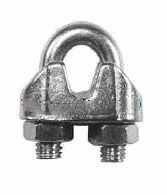 A wire rope grip is used to fix a loop into a rope and consists of a u-shaped bolt, a forged saddle and two nuts. The two layers of rope are placed in the u-bolt, the saddle is then fitted over the ropes on to the bolt and the nuts secure the arrangement in place. Three clamps are usually used to terminate a rope. 6mm Rope Grip. For use with 6mm rope. Galvanised mild steel. 8mm Rope Grip. For use with 8mm rope. Galvanised mild steel. 10mm Rope Grip. For use with 10mm rope. Galvanised mild steel. 12mm Rope Grip. For use with 12mm rope. Galvanised mild steel. 16mm Rope Grip. For use with 16mm rope. Galvanised mild steel. 20mm Rope Grip. For use with 20mm rope. Galvanised mild steel. 30mm Rope Grips, also known as Bull Dog Grips. Hot Dipped Galvanised Steel, to DIN 741 Specification. It is recommended to use 3 Clamps to secure a Rope End.